Artists: Silvia Amancei & Bogdan Armanu (RO), ALB (RO), Lörinc Borsos (HU), Mihai Iepure-Górski (RO), Tatjana Macic (NL), Andrei Nacu (RO), Astrit Ismaili (XK/NL), Kestutis Svirnelis (LT/DE), Johannes Hugo Stoll (DE), Taietzel Ticalos (RO). We live in a time where personal experiences and social discourses, political and cultural, are constantly sending to the idea of multiplicity. For the theoreticians of contemporary thought, the contemporary is an operative fiction, and to contribute to the present is fundamentally a productive act of imagination or dream, because we attribute to the present a sense of unity that traces the global disjunctive temporality, which we cannot encompass. If art, at present, is proposed as a synchronizing problem, the necessary condition for being relevant is the presentation of multiple temporalities and contextual problems, overlaid, directed towards the image of a timeless future in which the social equality prevails, the decoding capability of cultural languages acquires objectivity, acquiring freedoms is no longer conditioned by capital, technology or political accumulation. The curatorial project will engage around the idea that the representation of time or a temporal distance can not be neutral: neither in the sense of remembrance, idealization or condemnation of something of the past nor in the preventive planning of the future. Even more so: the issue of the past and the temporal scheme in which to represent the other has become a decisive factor in interpersonal, political and economic exchanges. How can we deconstruct these temporalities? How can we learn from the past futures what has already been conceived? What are they now? Is there a connection between these times and temporalities that converge into a contemporary? In this landscape of global crisis marked by the lack of a common future projection, the artists react answering to the structural and existential changes that affects social life. 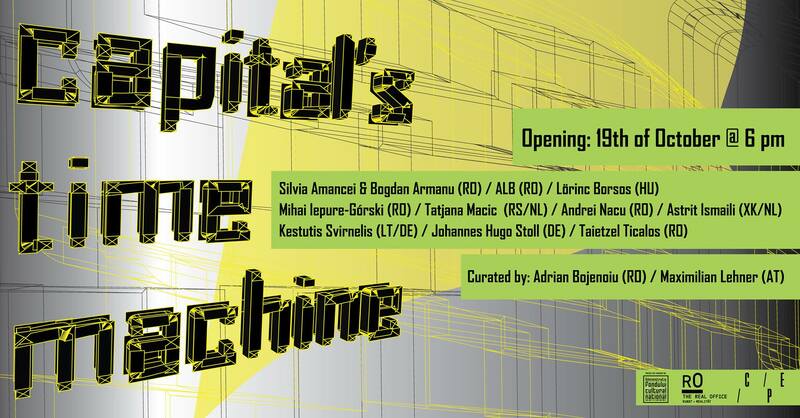 The project title “Capital’s Time Machine”, describes the general context in which the artists’ work is at stake today. The works proposed for this project are ways of seeing, interpreting and acting on the realities of the capitalist world. They seek to change the meanings and trajectories of contemporary life, through the poetical and critical interpretation of social and subjective memory, technological transformations, and changes in material, spiritual and ideological life. The works realized for this project will be placed in a Vending Machine device to be sold. The device will be installed in the Universe Palace, inside Beans & Dots – Cafe. The opening program includes the following activities. *Due to the operating conditions of the vending device, please note that the works can be sold exclusively with cash, in banknotes of 10 and 50 lei. Cultural project co-financed by the National Cultural Fund Administration. The project does not necessarily represent the position of the Administration of the National Cultural Fund. The AFCN is not responsible for the content of the project or the manner in which the results of the project may be used. These are entirely the responsibility of the funding recipient.